Today is a very special day as it's my dad's 80th birthday, an age definitely worth celebrating. Therefore, I decided on a light hearted, fun birthday card, to remind my dad to enjoy himself on this wonderful day. I feel so fortunate to have both my parents, in laws and a grandmother in law still in my life; it is a real pleasure and honour. 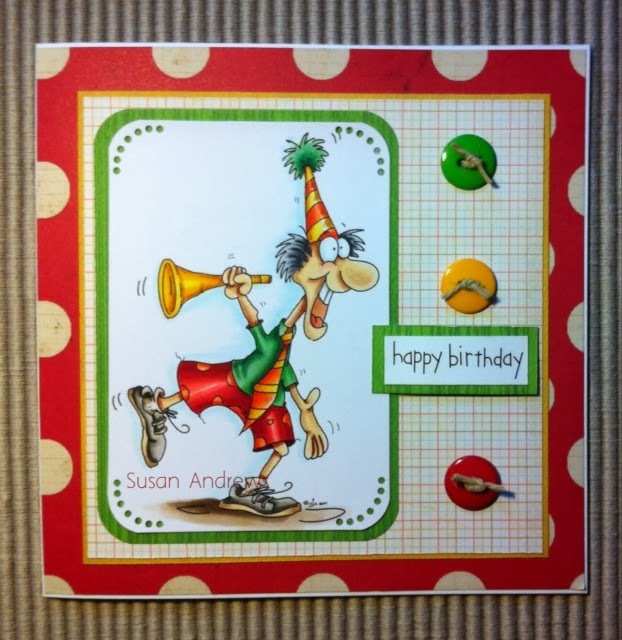 As for the card, this fun and crazy character is from Sassy Cheryl's Oldies but Goodies digital stamp collection. At the very least he is sure to bring a smile to anyone's face, in fact I'm sure this crazy guy would liven up any party. Wow, today I have an interesting challenge from Make It Colourful to share. Not only does Make It Colourful challenge us to colour eyes, they also give two categories for us to enter our projects. The first being a simpler challenge where the eyes are the focal point of the image. The second category makes things more interesting, or difficult depending on your perspective, by adding reflection to the eyes. Some amazing works of art have been produced in this challenge; the girls not only added reflections but also altered and added to the images to make them their own. It is well worth checking out at the Make It Colouful blog. 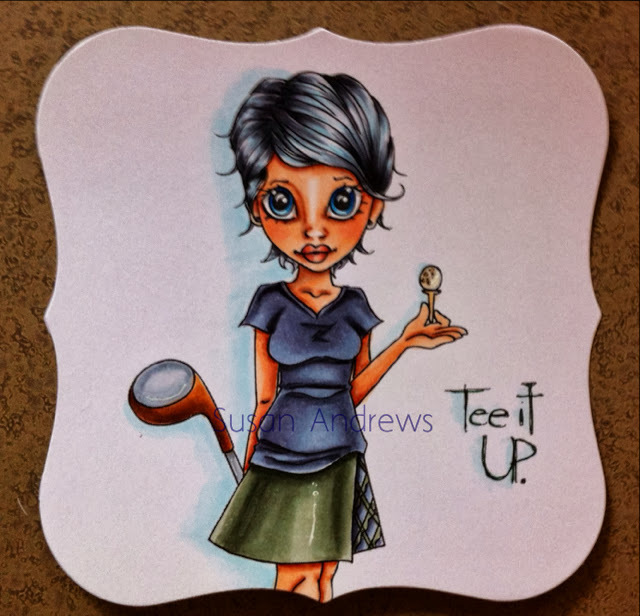 Anyways, I decided to enter the easy challenge using one of the new images from Make It Crafty, the lovely Melyssa. She's super cute and great fun to colour. Not only did my first attempt allow me to practice colouring eyes in greater detail, I also got to try using Copics along with Prismacolor pencils. I am quite happy with the results of using the two mediums together, and I will will be practicing this technique some more. 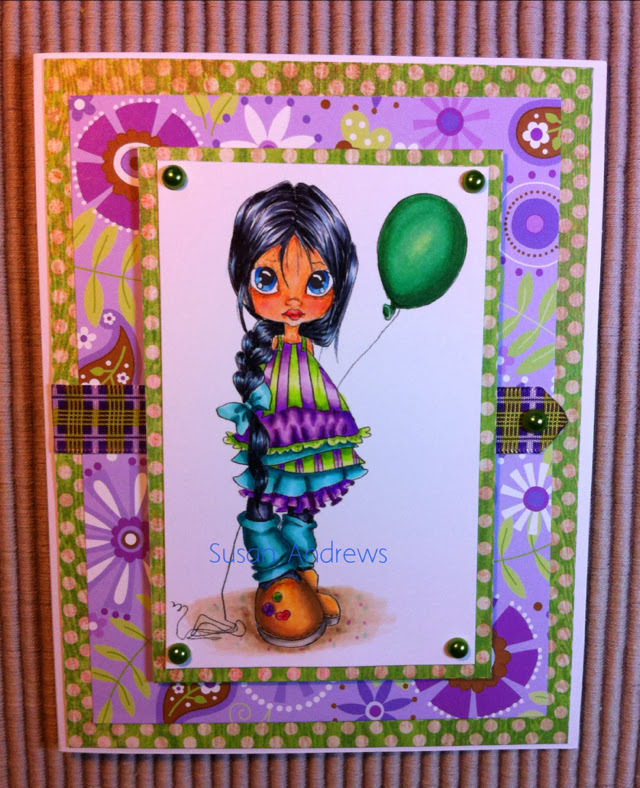 Just as Balloons and birthdays go hand in hand, this little cutie Ava, from Saturated Canary makes for a great birthday card. This image was one I coloured a while back. 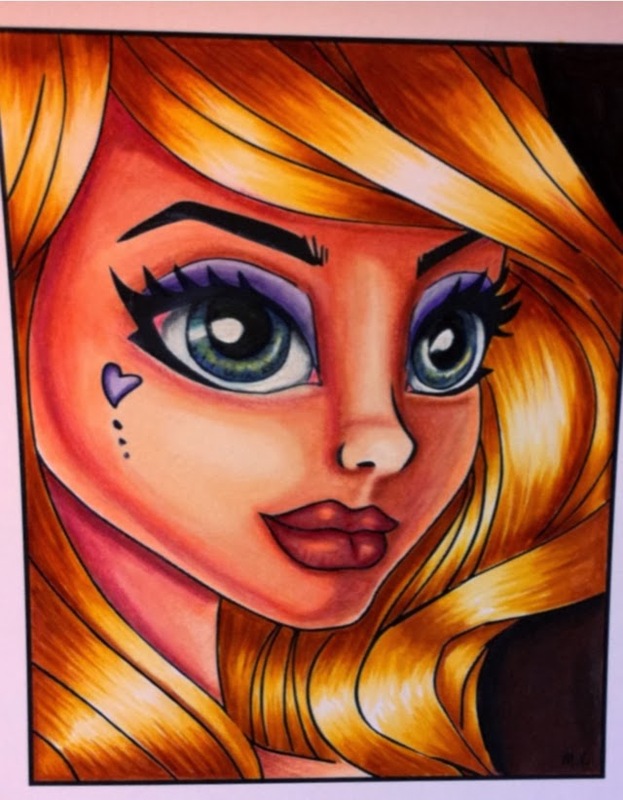 Unfortunately at times I find that Copic skin colours do not blend as nice as I would like. In fact once in awhile the markers become sticky and no matter how much blending I do they will not smooth out, possibly becoming muddy. 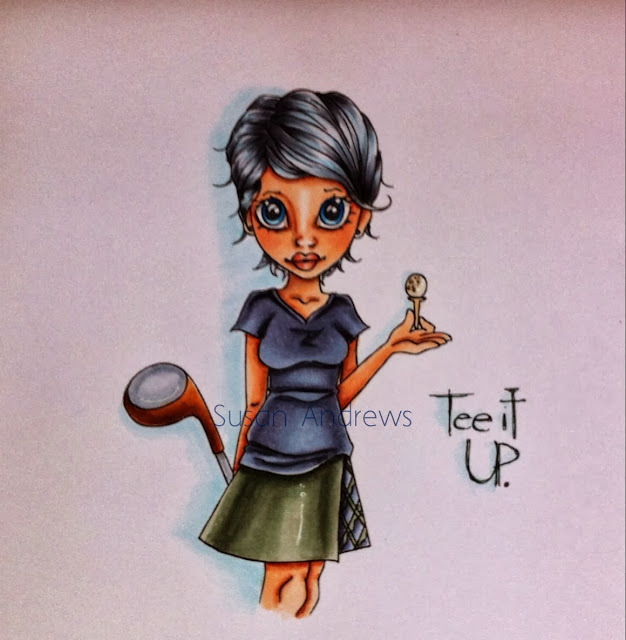 As for this little gals face I am not really happy with it, yet the rest of the image turned out just fine. 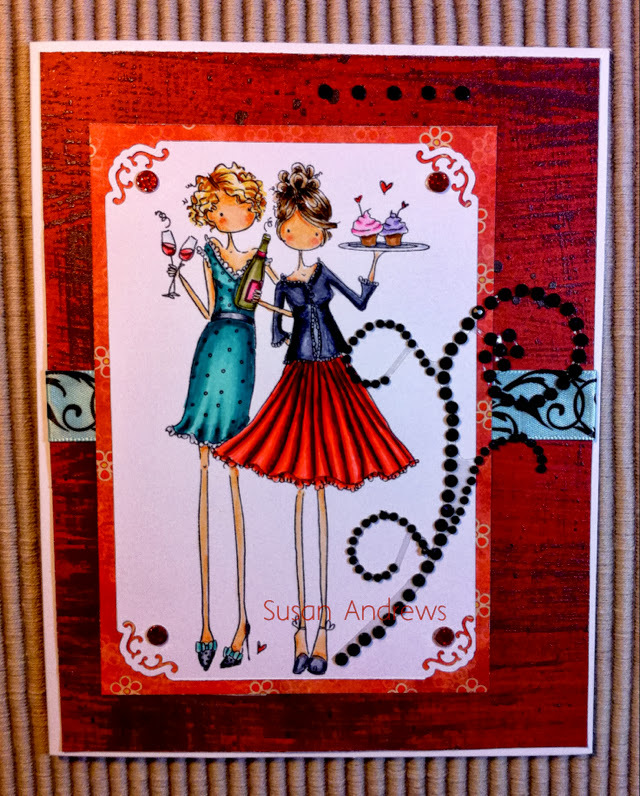 Despite this I went ahead and create a cheerful bright card for a friends birthday. 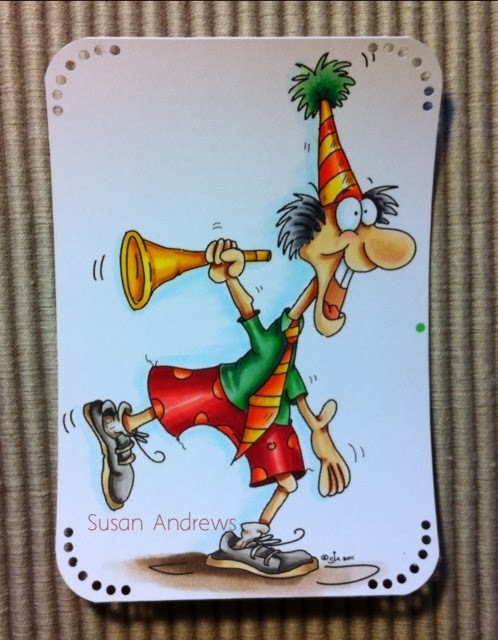 Throughout October I have quite a few birthdays cards to prepare for, therefore I chose to use a few of my previously coloured images to help me along. 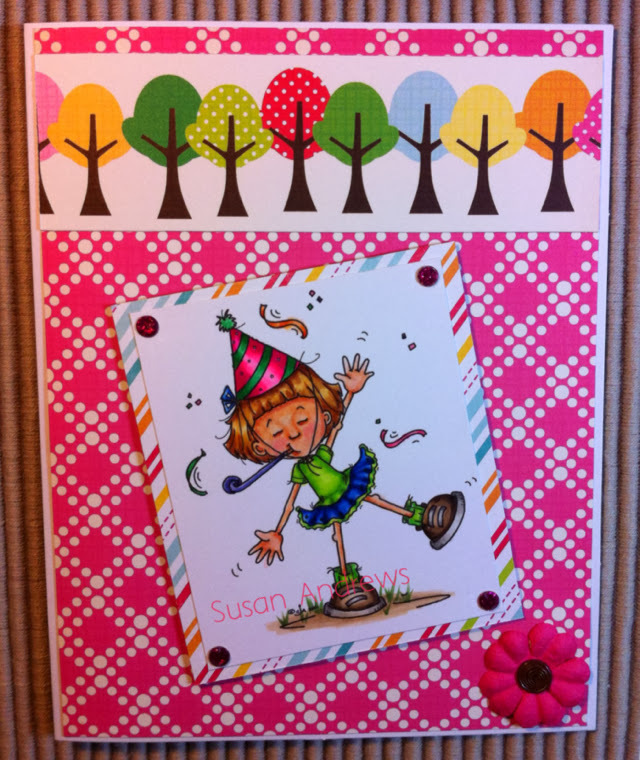 This particular let's party girl, named Sally is from Sassy Cheryl's digital stamps, she knows how to let go while bringing a sense of fun to the day.